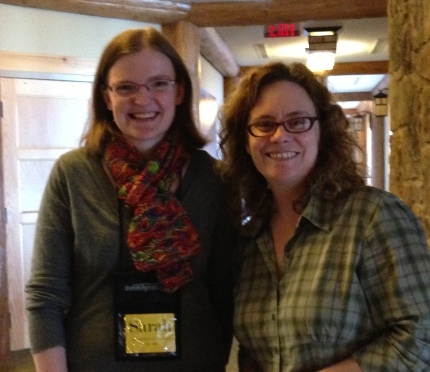 Over the weekend I had the extreme pleasure of getting to take part in a knitting retreat with the Yarn Harlot, aka Stephanie Pearl-McPhee. There were 18 of us who got to learn from her, knit with her and laugh with her, and each other along the way. We took three classes over the weekend, including knitting for speed and efficiency (in which she attempted to teach us to knit with one needle under our arms), grok the sock (where we learned how to knit a sock for ourselves without a tape measure) and knitting with silk hankies. That one was particularly fun because we got to take the silk cocoons and make hankies out of them, then turned others into a knittable substance. I’ve had some of these in my closet for a while and am glad to know how to use them — and what goes into making them. There was also a more public lecture about the wonderful things knitting does to our brains, and a book signing at which the picture above was taken. There was also snow, in May, for the second time in recorded history in Arkansas (the first was the day before). 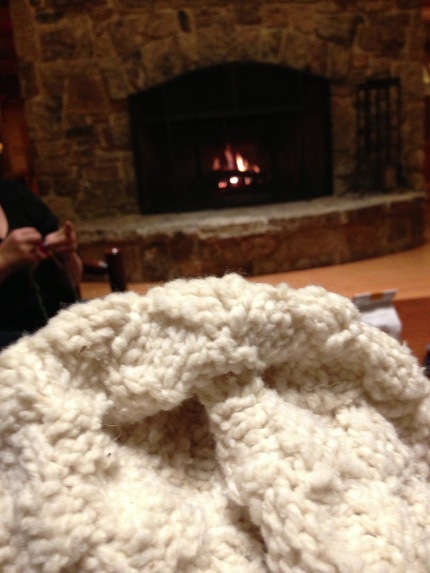 So there was knitting by the fire. That project is a gigantic wool cowl (or, if I decide it’s too wide to be a cowl, it will probably become a pillow) made out of the Clara Yarn I told you about. It’s really lovely stuff, and was the perfect antidote to unseasonably cold weather. I know we don’t all have the opportunity or the means to have such an extravagant getaway, but if you ever find yourself in the position to run away and knit for a weekend, I highly recommend you do it! I’m intrigued by the knitting from silk hankies part.